10 Year Warranty. 100 % Recyclable. An icon of modern design, the Classic 40/4 Chair designed by David Rowland is one of the most strikingly original designs of the 20th Century and into the 21st. Distinguished design, uncompromising comfort, and extraordinary durability confirm that they need not be sacrificed for convenience. Deceptively delicate contours disguise its rugged functionality. The sturdy slender frame is engineered to withstand constant use. Chic, yet solidly built, the ergonomically sculpted seat and back add a graceful note to the chair’s disciplined lines that support the body in comfort. 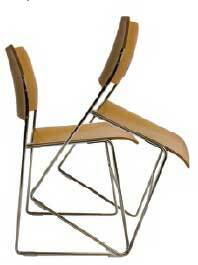 Will fit all standard, bar and counter height chairs manufactured after 2013. Will fit all standard, bar and counter height chairs mfr. after 2013.